Our most popular unit is a rear entry water slide that is recommended for children 5 years old and older. Adults may also enjoy this fun slide. water slide that is recommended for children 5 years old and older. Adults will also enjoy this slide. The name says it all. MiamiWaterSlides is the top place to reserve your water slide in Miami-Dade and Broward. We have a great variety of water slides for all likes and needs. Reserve your Water Slide today. Wild Rapids is a one of a kind water slide. Its design is unique and it is sure to be a big hit for your party or event. This is the Porsche of Water Slides. Wild Rapids is the first inner tube Water Slide ever created. Imagine what your neighbors will say! This front entry water slide is recommended for children 5 years old and older. The ultimate water experience for these long summer days. 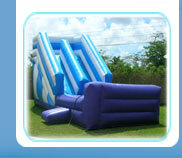 This 18ft rear entry slide can be rented wet or dry and is recommended for children over 4. Select the slide into your own pool option. It will be like having your own backyard Water Park! for children between the ages of 2-7.
while you slide down the super-slippery slide. Copyright © 2008 Jump and Party, inc. All rights reserved.